I visited Paris for the first time when I was a twenty-year-old college student. I can close my eyes and remember what the unfamiliar city looked like to me during this initial encounter—the orderliness of the public gardens with their gravel walkways, wooden benches and round-seated metal chairs; the relative smallness of the automobiles; and the historic monuments gleaming under floodlights at night. Coming from the United States—the New World— the enormous weight of history Paris carried was a visceral shock, especially the buildings: Medieval cloisters, Gothic cathedrals, seventeenth century catacombs, Revolutionary and Napoleonic monuments, and elegant 19th-century apartment blocks. But I was fascinated even more by the traces left behind by the Second World War. Rather than buildings and monuments, the trauma of the war and the Nazi Occupation remains present in mundane, unexpected, and easy-to-overlook markers scattered throughout the city. There were seats on the metro reserved for the war wounded. The first time I saw these signs, the French term mutilés de guerre, which had originated to refer to wounded veterans from the First World War, stunned me in its graphicness. I was always expecting to see men with empty sleeves or wooden legs sitting in the designated seats. 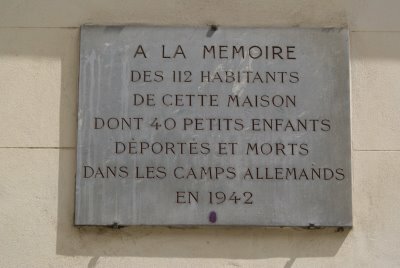 All around the city, I noticed marble plaques on walls commemorating groups and individuals who had struggled and suffered during the Occupation, ranging from Jewish children who had been deported to blind people who had participated in the Resistance, and young men who had died fighting on the streets liberating Paris in August 1944. During the ten years I spent researching and writing my novel All The Light There Was, I realized that the manner in which Paris memorialized les années noires (the dark years) was in many ways akin to how it had experienced the war. The city was spared the horrific bombing that devastated London and Berlin. But loss and fear were interwoven into every corner of the city; I realized that my biggest task as a writer was to convey the immediate if mostly commonplace presence of that constant looming terror, even as daily life went on. Several salient factors about how most Parisians had lived the war came through in everything I learned. It was a dark time both literally and figuratively. There were black outs and black out curtains limiting sight and vision. Political repression backed up by deportation and systemic violence, censorship, self-censorship, and denunciations by neighbors all resulted in a feeling of moral darkness and isolation. In addition to this pervasive gloom, people were hungry. The Germans used France as their breadbasket during the war, taking vast quantities of French agricultural products such as wheat, butter, cheese, and wine, leaving the French to subsist on root vegetables that had formerly been cattle fodder. Parisian grimly joked about the German doryphores (potato bugs) who had made off with all their potatoes. A third factor that came up in all the accounts was how cold people were during the bitter winters of the Occupation. With the German war machine siphoning off oil, gas and coal, there was not much left for heating Parisian apartments and schools. When I was writing the novel, it was as though every day I left my home in Manhattan and spent a few hours with my characters in their Belleville apartment. I heard the sounds of the concierge’s bucket and mop on the landing. I smelled the dreaded rutabagas cooking in the kitchen. And I shivered with Maral, my narrator and main character, as she bundled into several sweaters before crawling into her glacial bed. This was the Paris that I traveled to on a daily basis for almost ten years—not the romantic city of my student days, nor the place where on family holiday I took my children to play on the brightly colored climbing structures in the Jardin des Tuileries. It was a somber city, a city of shadows and privation, but also a place where people of conscience worked hard to keep a small light of dignity burning in an inhumane time. Now that I have finished the book, I understand that the Paris of 70 years ago has yet to truly vanish: its ghost-like presence gently marks the city landscape. And now, on my next visit to Paris, I have Maral, her friends, and her family, to walk with me as guides to that almost-hidden past. This essay was originally published on the American Library in Paris blog on the 16th of April 2013.